The Layers docker is for one of the core concepts of Krita: Layer Management. You can add, delete, rename, duplicate and do many other things to layers here. You can select the active layer here. Using Shift and Ctrl you can select multiple layers and drag-and-drop them. You can also change the visibility, edit state, alpha inheritance and rename layers. You can open and close groups, and you can drag and drop layers, either to reorder them, or to put them in groups. The Layer name, just do double- to make it editable, and press Enter to finish editing. This is a color that you can set on the layer. the layer to get a context menu to assign a color to it. You can then later filter on these colors. This will set the Blending Modes of the layer. This will set the opacity of the whole layer. An eye-icon. Clicking this can hide a whole layer. A lock Icon. Clicking this will prevent the layer from being edited, useful when handling large amounts of layers. This will prevent the alpha of the layer being edited. In more plain terms: This will prevent the transparency of a layer being changed. Useful in coloring images. Only available on Group Layers, this allows you to have the blending modes of the layers within affect the layers outside the group. Doesn’t work with masks currently, therefore these have a strike-through on group layers set to pass-through. This will use the alpha of all the peers of this layer as a transparency mask. For a full explanation see Introduction to Layers and Masks. (An Arrow Icon) This will allow you to access sub-layers of a layer. Seen with masks and groups. This is only available on animated layers, and toggles the onion skin feature. This is only available on layers which have a Layer Styles assigned. The button allows you to switch between on/off quickly. To edit these properties on multiple layers at once, press the properties option when you have multiple layers selected or press F3. There, to change the names of all layers, the checkbox before Name should be ticked after which you can type in a name. 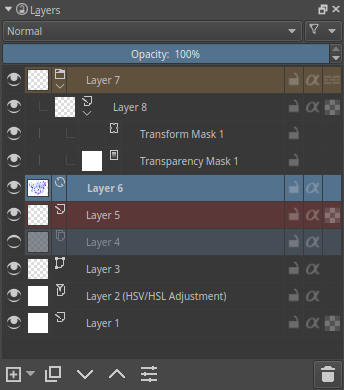 Krita will automatically add a number behind the layer names. You can change other layer properties like visibility, opacity, lock states, etc. too. These are buttons for doing layer operations. Will by default add a new Paint Layer, but using the little arrow, you can call a sub-menu with the other layer types. Will Duplicate the active layer(s). Can be quickly invoked with Ctrl + + drag. Will move the active layer up. Will switch them out and in groups when coming across them. Will move the active layer down. Will switch them out and in groups when coming across them. Will open the layer properties window. Will delete the active layer(s). For safety reasons, you can only delete visible layers. Shift + Ctrl for selecting multiple layers. Ctrl + + drag - makes a duplicate of the selected layers, for you to drag and drop. Ctrl + E for merging a layer down. This also merges selected layers, layer styles and will keep selection masks in tact. Using Ctrl + E on a single layer with a mask will merge down the mask into the layer. Ctrl + Shift + E merges all layers. R + allows you to select layers on canvas, similar to picking colors directly on canvas. Use Shift + R + for multiple layers. Ins for adding a new layer. Ctrl + G will create a group layer. If multiple layers are selected, they are put into the group layer. Ctrl + Shift + G will quickly set-up a clipping group, with the selected layers added into the group, and a new layer added on top with alpha-inheritance turned on, ready for painting! Ctrl + Alt + G will ungroup layers inside a group. Alt + on the thumbnail for isolated view of a layer. This will maintain between layers till the same action is repeated again. Shift + on the eye-icon for hiding all but the current layer. Page Up and Page Down for switching between layers. Ctrl + Page Up and Ctrl + Page Down will move the selected layers up and down.